We have a neighborhood smoothie bar with a tiny fridge filled with amazing pre-made salads. They make these salads each day in-house. Having failed at enjoying any kale salad I had ever tried my hand at making – I tried this winter kale salad with its awesome-sauce citrus vinaigrette on a whim. Instantly, I was transformed into the smitten kale kitten. I was crazy for this salad like I had never loved a kale salad before. I knew the nutritional benefits of kale and I really had wanted to love it. But it just hadn’t happened for me until this mind blowing kale salad! 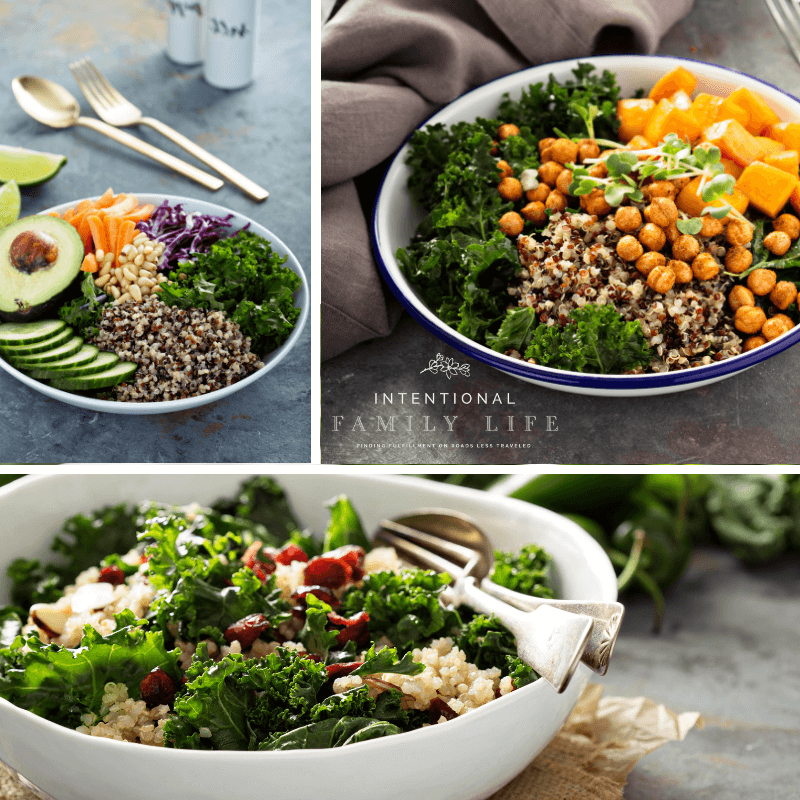 (Read further for the ultimate secret to #winning at preparing a fabulous kale salad!) This is my copy of a kale salad with citrus vinaigrette that satisfies each and every time I get it from my local smoothie bar or make it at home. 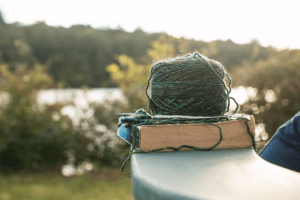 And, strangely enough, it makes me feel just as cozy as a bowl of soup. It’s no secret that I love salads! They are the perfect delivery vehicle for all manner of delicious fruits and vegetables! But they can be decidedly summer-y. I fell in love with salads in the cooler months when a friend of mine made an amazing winter salad covering all the yummy salad fixin’s with slices of warm spicy grilled chicken. It was that combination of cool and crisp and warm and spicy that did me in. Think tacos. And from there, I’ve branched out to find more satisfying winter salads – both warm and cool – that nurture my winter instinct to snuggle and hibernate. I particularly like the sweetness of the citrus vinaigrette that is such a great contrast to the earthy and slightly bitter flavor of the kale. Remember when we were growing up and “kale” (we didn’t even know what to call it back then) was the stuff, along with curly parsley, that got stuffed under the main attraction on every party platter around? Kale. What can I say? You’ve come a long way, baby! You’ve gone from inedible understudy to spotlight thief. The nutrient density of kale is phenomenal. It also provides key nutrients that can be difficult to find elsewhere. Contains almost twice as much fiber as most other grains. Fiber is necessary for relieving constipation. Contains iron which is a mineral needed to maintain healthy red blood cells and increases brain function by increasing oxygen flow to the brain, iron aids in the synthesis of neurotransmitters, regulation of body temperature, enzyme activity and energy metabolism. Contains lysine which is essential for tissue growth and repair. Is rich in magnesium. 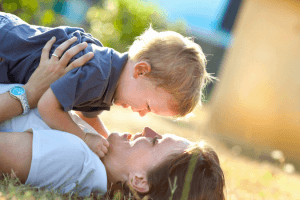 It is estimated that at least half of Americans are magnesium deficient. Magnesium is necessary for over 300 biochemical reactions in your body. Magnesium also may reduce Type 2 diabetes by promoting healthy blood sugar control. Other health benefits of magnesium include transmission of nerve impulses, body temperature regulation, detoxification, energy production, and the formation of healthy bones and teeth. Is high in vitamin B2 which improves energy metabolism within brain and muscle cells and helps create proper energy production in cells. Is high in Manganese which is an antioxidant that helps to prevent mitochondrial damage during energy production. 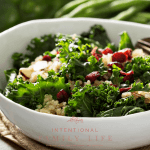 The Secret To Kale Salad Perfection – It’s Weird But It Works! So here’s the thing. When kale became all the rage – I tried to like it. I really did. I found great recipes and made it at home – at least half a dozen times. Yet, it always tasted like something I snatched off the ground and ate to survive in the wilderness without any provisions. But when I went to a restaurant, or my favorite smoothie bar, their kale was amazing! So what was I missing? After recounting my trials and tribulations with kale, I asked how they made theirs at the smoothie bar. And the guy there admits to me…there’s a secret to making kale good. And then he told me. Guy: No. Massage your kale. So there you have it. 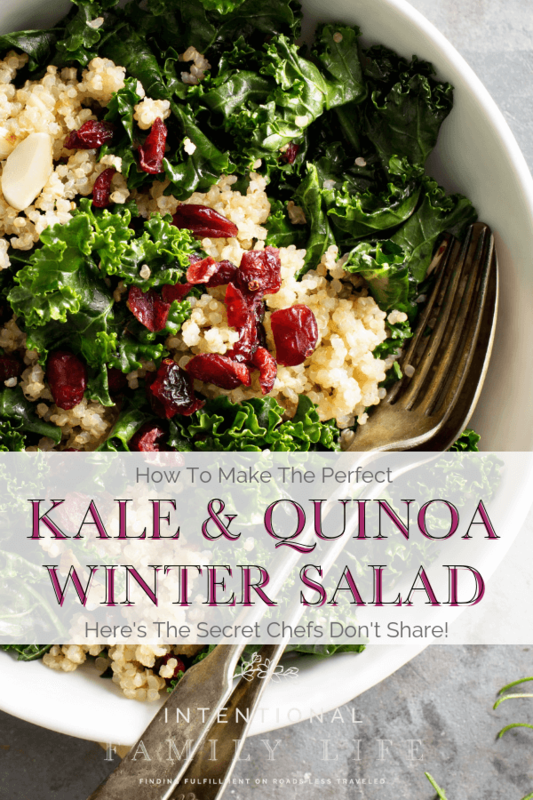 The secret that you’ve been missing for your perfect winter salad with kale! I always love a good salad. And we're so lucky that during the cooler months, we can still find delicious fresh ingredients to use - kale, cranberries, quinoa! I love this amazing craving quenching salad filled with nutrients! In a small mixing bowl, combine the orange / tangerine juice, orange zest, vinegar, mustard, and honey. Next add in mayonnaise, salt, pepper, and red pepper flakes (if using) and whisk to combine. Slowly drizzle in the avocado or olive oil while whisking vigorously until the dressing has emulsified and all the mayonnaise "blobs" have become creamy. Alternatively, you can add all ingredients into a blender and mix until the dressing is silky and emulsified. At this stage, taste the dressing and adjust the seasonings as you wish. The best way to taste test your dressing is to dip a veggie in it - say, a slice of cucumber, piece of kale, or tomato. If you sample by dipping your finger in, most dressings will always taste overly strong. Follow the instructions for your quinoa and go ahead and cook it. You'll want one cup of already cooked quinoa for this recipe. Remove the kale leaves from either side of the tough center rib. Once you've removed the tough ribs, make a stack of five to ten leaf halves and slice thinly across the leaf creating a fine shred. Place the sliced kale into a large mixing bowl and add enough dressing to just barely coat the leaves. You've waited for it and now it's time. MASSAGE that kale, girl!!! Get your hands in that bowl and massage the dressing into the kale. If nobody's watching, I love me a little KC & the Sunshine Band while I massage. Don't judge. How long to massage is somewhat subjective, but I massage my kale until I feel that it's texture has softened up a good bit. HINT: the more thinly you slice the kale, the less massaging it will need. Now you can add the quinoa, tomatoes, cucumbers, cranberries, and sunflower seeds. Toss so that all ingredients are completely combined. Transfer to a serving dish and drizzle with remaining dressing, or to taste. Seasoned roasted chickpeas for some added crunch! Deconstructed salads – bowls – are all the rage now. So a beautiful way to present this hearty winter salad would be to give each ingredient its own special place in the bowl to shine. Then drizzle your citrus vinaigrette over the whole thing. You can mix and match ingredients to get a perfectly unique tasty bite each time. This would be a beautiful presentation if you wanted to bring this dish to a party! Then each guest can create their unique perfect salad. Also, remember that kale is no shrinking violet. This kale salad will hold its crunch for at least twenty-four hours.